Tivoli Hotels & Resorts has announced its first property in the Alentejo region of Portugal in the historic city of Évora, joining the brand’s other timelessly elegant properties in Portugal, Brazil and Qatar. The Tivoli Évora Ecoresort, scheduled to launch in the third quarter of 2018, will be a nature retreat boasting gorgeous scenery and unique cultural experiences. Currently operating as the Ecorkhotel, Évora – Suites & Spa, the property is located on the lush plains of Portugal’s south-central Alentejo region, just a five-minute drive from the historic centre of Évora, a Unesco World Heritage Site, and a one-hour drive from the capital Lisbon. Surrounded by age-old cork oak and olive trees, the property is designed in sustainable contemporary style. Soft architectural lines blend perfectly into the verdant landscape, with 56 suites carefully placed around the 38,000-sq-m grounds, providing ultimate privacy and tranquillity for guests. All suites are warmly decorated with natural elements such as wool and cork, with outside areas for relaxing amidst the sounds of nature. As part of a refurbishment programme, an exclusive new villa with nine guest rooms and a private outdoor swimming pool will be added to the resort. The main restaurant takes guests on a journey around Portugal with local and seasonal produce, much of which sourced directly from the hotel's own biological garden, ensuring high quality and freshness. The lobby bar provides decadent drinks and snacks to enjoy a winter's afternoon by the traditional open fire or to cool down on hot summer days. 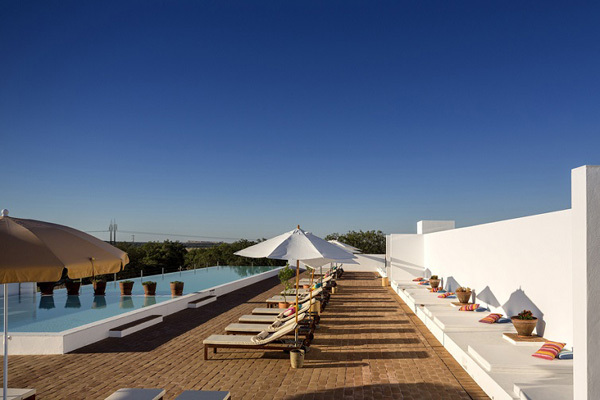 On the first floor of the central building, the infinity pool bar will serve freshly squeezed fruit juices in the morning and creative cocktails to accompany captivating sunsets overlooking the Alentejo countryside. “We are very pleased to announce the first Tivoli Hotel in the Alentejo region and the brand’s eleventh property in Portugal. This ecoresort is a perfect complement to our portfolio in the country and represents our arrival in a fascinating region where tourism has grown sustainably. This launch is an important step in the expansion of Tivoli and Minor Hotels in Portugal,” said Marco Amaral, vice-president of Operations and Development in Europe and South America for Minor Hotels, the parent company of Tivoli Hotels & Resorts.